The Wisconsin Poet Laureate Commission, in partnership with the Wisconsin Academy of Sciences, Arts and Letters, seeks applications for the 2019-2020 Wisconsin Poet Laureate. Beginning August 20, 2018, applications are welcome from individual poets who are seeking the position. Applications may also be submitted by a person who is nominating a poet for the position of Poet Laureate. For either, a complete application package must be sent to the Wisconsin Poet Laureate Commission (wipoetlaureate@gmail.com) as one email attachment no later than October 5, 2018. The Poet Laureate plays a crucial role in keeping the arts accessible and vital to all age groups, and acts as a statewide emissary for poetry and creativity. The Wisconsin Poet Laureate Commission embraces the diversity of human experience, identity, and literary aesthetics. All applications are welcome, regardless of race, ethnicity, gender, sexual orientation, cultural heritage, socio-economic background, physical ability or poetic sub-genre. And in fact, those very aspects of identity are factors the committee will take into account when making its selection, in the pursuit of the Poet Laureate Program being representative of the rich and diverse cultures of poetry in the State of Wisconsin. The Poet Laureate’s term of service is two years. The next term begins on January 1, 2019 and ends on December 31, 2020.
contribute to the growth of poetry throughout the state. plan and/or attend statewide literary events and educational programs. visit each region of the state at least once during the two-year term. promote poetry and the Poet Laureate position via electronic social media. participate in selecting the succeeding Poet Laureate and guide the transition into the role. prepare and provide a written report of activities every six months or upon request of the Poet Laureate Commission. The Poet Laureate will be awarded a $2,500 stipend per year, which honors the poet’s achievements and helps to defray expenses not reimbursed by individual organizations where the Poet Laureate is a guest. The Poet Laureate is encouraged to accept honoraria or remuneration from host organizations. The Poet Laureate Commission will work with the Poet Laureate and the Wisconsin Academy of Sciences, Arts & Letters to facilitate press coverage related to key activities. A limited edition broadside of the Poet Laureate’s work will be produced. In each year of the two-year appointment, the Poet Laureate will be awarded a one-week stay at Shake Rag Alley Center for Arts and Crafts in Mineral Point. The Poet Laureate will be featured in an issue of the Wisconsin Academy of Sciences, Arts and Letter’s Wisconsin People & Ideas Magazine. The applicant should show evidence of achievement in the art of poetry, including substantial publications (books, literary magazines, and/or digital media). The applicant should have received significant recognition or awards. The applicant should demonstrate excellence in promoting awareness or enjoyment of poetry. The applicant must have been a resident of Wisconsin for at least three years prior to the application deadline. The applicant must be able and available to reach statewide audiences through travel or other means. A one-page cover letter that includes contact information for the applicant and the nominator, if applicable. A work sample not to exceed six (6) pages, 8 ½ x 11, no less than a 12-point font, no more than one poem on each page. The work sample may contain information that indicates where the poem has been published or performed, or if it has received any awards for merit. The applicant’s résumé or curriculum vitae not to exceed two (2) pages. An explanation of what the applicant would hope to accomplish during the two years as Poet Laureate, including potential ideas for a Poet Laureate’s special project (up to two pages). (Optional) Up to two (2) pages of supplementary materials, including excerpts from published book reviews, judges’ comments, or other critical writings that help contextualize the poet’s work for the commission. Note: recommendation letters are not appropriate and will not be considered. (As needed) An application package submitted by a nominator must include a statement signed by the nominated poet indicating the poet’s awareness of the nomination, willingness to participate in the selection process, ability to fulfill the requirements of the Wisconsin Poet Laureate, if selected, and verification that the work sample submitted accurately represents the poet’s own work. The statement may be electronically signed as a .pdf or physically signed and scanned. Completed application packets should be saved as a single .pdf file and submitted via e-mail to the Wisconsin Poet Laureate Commission at wipoetlaureate@gmail.com. In order to be considered, application packets must be received by midnight on Friday, October 5, 2018. The Commission reviews all submitted materials to arrive at three (3) finalists. The three (3) finalists are interviewed in person by the Commission, which makes its final decision about selecting the new Poet Laureate based on the application packets and the interviews. The Commission may acknowledge the other finalists as Commended Poets. November 11, MMOCA, Madison, 12 noon: Finalist Interviews. New Laureate is selected and notified thereafter. November 18, Snow date interview. Karla Huston, Wisconsin Poet Laureate for 2017–2018, lives in Appleton, Wisconsin. Huston’s poems find their roots in the stories we tell, those memories which define us as human. Her poems often draw on personae from Greek myth to art to Hollywood movie stars of yore to explore a range of ideas and issues—recurrent among them are topics related to aging and women. The author of eight chapbooks of poems, the latest Grief Bone, (Five Oaks Press), and a full collection A Theory of Lipstick (Main Street Rag Publications), Huston’s work has garnered many awards, including a Pushcart Prize for the poem “Theory of Lipstick” in 2011. In 2013 she received an Outstanding Achievement Award from the Wisconsin Library Association for her collection of the same title. Huston’s writing has earned residencies at Ragdale Foundation as well as the Bread Loaf Writers’ Conference. Her chapbook, Flight Patterns won the Main Street Rag Chapbook Contest in 2003. Huston has also been awarded three Jade Rings (one for fiction, two for poetry) from Wisconsin Writers’ Association. A lifelong resident of Wisconsin, Huston is a graduate of West Salem High School. She has earned degrees from the University of Wisconsin Oshkosh: BS in Education and an MA in English and Creative Writing. Huston started writing poetry when she began teaching creative writing in the mid-nineties at Neenah High School where she worked for fifteen years. Huston is active in the Wisconsin writing community and beyond. She has served on the board of directors for Wisconsin Fellowship of Poets as well as the Fox Valley Writing project, an offshoot the National Writing Project, which stresses teachers teaching teachers and encourages cross-curricular writing. Currently she is active on the board of the Council for Wisconsin Writers (CWW) as secretary and contest co-chair, helping to promote CWW’s mission to honor Wisconsin writers through their annual Wisconsin Writing Awards. In addition Huston serves as vice president, membership coordinator, and teaching staff at The Mill: A Place for Writers, a Fox Cities venue that offers a creative environment to encourage the growth of the literary community and provides learning opportunities for writers at all levels. 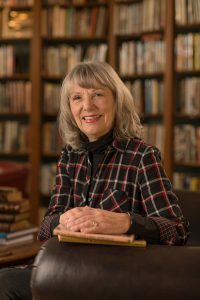 For several years she has contributed to the Fox Cities Book Festival helping to create poetry events during the festival. She enjoys speaking to the public about poetry and the arts, especially about why it is necessary to both the individual and the community. Past events have included: UW Whitewater High School Creative Writing Festival, keynote speaker; Menasha Rotary, luncheon speaker; Mt. Mary University Leadership Institute, poetry and the business world; and The Great Lakes Writers Festival at Lakeland University, featured writer. In May of 2011 the Wisconsin Academy of Sciences, Arts and Letters announced their stewardship of the Wisconsin Poet Laureate program, created by Wisconsin Governor Tommy Thompson in Executive Order 404 on July 31, 2000. The Wisconsin Poet Laureate Commission has as its purpose to conduct the Wisconsin Poet Laureate selection process, assign responsibilities to the selected Poet Laureate, and assist that individual in performing official duties. Members of the Commission include representatives from the Wisconsin Center for the Book, the Wisconsin Fellowship of Poets, the Wisconsin Humanities Council, the Wisconsin Arts Board, and the Wisconsin Academy of Sciences, Arts and Letters, as well as several at-large members.